I use Shure SM7 microphones. These are famous for being the mics that Michael Jackson used to record his vocals for Thriller, but they’re really a great all-purpose microphone. They’re also tough and cheap – at least compared to other studio vocal microphones. They cost about three hundred bucks, and the next step up is several thousand. They work great for my purposes because their pickup pattern really emphasizes the guest and de-emphasizes the guy outside my window with the leaf blower. Very forgiving. My mixer is a Mackie Onyx 1620, with the optional built-in firewire audio interface. The SM7s need a lot of gain (signal boost) and Mackie has a reputation for having the cleanest microphone pre-amps. For phone interviews I have a Telos One. 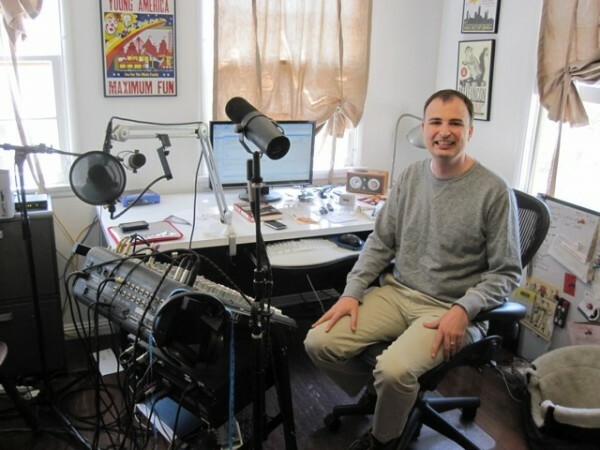 We actually don’t do phone interviews anymore, but I do do “tape syncs,” which are the poor man’s way to link up two studios – no ISDN here, so I just put a remote guest in a studio, call them up, record on both ends, and match them up later. My CD player is the cheapest rack-mounted CD player I could find. Same story with my headphones and headphone amp. I listen back on B- headphones, because I figure that’s how most people will listen anyway. The radio on my desk (which is also my monitor) is a Tivoli Audio Model Three, which is a wonderful machine that I recommend highly – especially if you get it for $14.99 on clearance at Target, which I did. I do my backup recording with a Zoom H4 flash recorder, and store my many huge files on a Drobo with four terabyte drives in it. My shows are hosted with the very good folks at Libsyn. The bulk of the cost for Thorn’s home podcasting setup was his Shure SM7 mic, his Mackie mixer & audio interface, and Adobe Audition. While Thorn has a mixture of low-budget and professional gear, he says that the key to getting good audio quality is not the gear, but how you use it. Cool! But what is that rack he has his Mackie mixer mounted on? There are a lot of variations on that mixer rack idea. I got something similar at Radio Shack for about $60 a few years ago. Just do a search for “mixer rack” on Google and you’ll see tons of options. I bought that rack at a yard sale. It’s by Tama, whatever that is.